A reactor “SCRAM” (or “reactor trip”) is the rapid insertion or fall of the control rods into the core to stop the fission chain reaction. At PWRs, all control rods are usually inserted within two to four seconds. Control rods are an important safety and control system of nuclear reactors. Their prompt action and prompt response of the reactor is indispensable. Control rods are used for maintaining the desired state of chain reaction within a nuclear reactor (i.e. subcritical state, critical state, supercritical state). Reactor Trip System (RTS), which actuates a reactor trip, is a part of a Reactor Protection System (RPS). In a pressurized water reactor, the control rods are inserted (dropped) from the top of the reactor vessel into the core. In a boiling water reactor, the control rods are inserted from the bottom of the reactor vessel into the core. 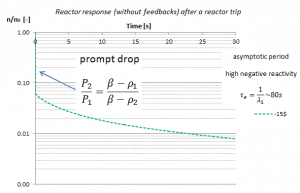 A reactor is considered to be shut down when it is subcritical and sufficient shutdown reactivity exists so there is no immediate probability of secondary criticality. Despite the fact the chain reaction is quickly broken down, all of the fissioning in the core is not stopped. There are always neutrons in the core and therefore a residual fissioning occurs. On the other hand, the amount of heat being generated due to the residual fissions (initiated by source neutrons) which are not stopped and the decay heat is much less than that which can be removed by the plant systems. Assume a reactor trip from hot zero power (from “zero power criticality”). The power decrease, in this case, does not influence the criticality (keff). In this case, the reactivity of the multiplying system becomes quickly negative and higher than β (i.e.that ρ is negative and ρ ≪ β). 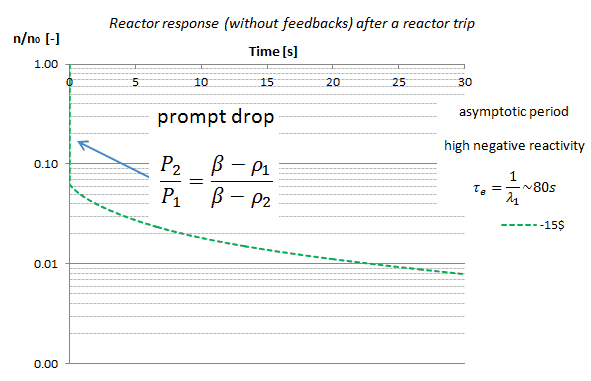 The rate at which the reactor fission rate decays immediately following shutdown is similar for all reactors provided a large amount of negative reactivity is inserted. After a large negative reactivity addition the neutron level undergoes a rapid decrease of about two decades (prompt drop) until it is at the level of production of delayed neutrons. The neutron flux then continues to fall according to stable period. The first root of reactivity equation occurs at s0 = – λ1, the decay constant of the long-lived precursors group. The shortest negative stable period is then e = – 1/λ1 = -80s. The neutron flux cannot be reduced more rapidly than this period. On the other hand, the prompt drop causes an immediate drop to about 6% of rated power and within few tens of seconds the thermal power which originates from nuclear fission is below the thermal power which originates from decay heat. There is an exception to this behavior and it is a SCRAM of heavy water reactor. In a heavy water reactor, the photoneutron source is extremely large after shutdown due to the amount of deuterium in the moderator and the large number of high energy gammas from short-lived fission product decay. This high gamma flux from short-lived fission products will decrease rapidly after shutdown. The photoneutron source is large enough to have a significant impact on neutron population immediately after shutdown. The photoneutron source has the result of flux levels decreasing more slowly so that a heavy water reactor will have a significantly larger negative reactor period after a shutdown. but the subsequent power decrease is strongly influenced by changes in core (fuel and moderator) temperatures. After reaching stable temperature, the neutron flux may continue to fall (when subcritical) according to stable period. It is obvious, if the power defect for PWRs is about 2500pcm (about 4 βeff), the control rods must weigh more than 2500pcm to achieve the subcritical condition. To ensure the safe subcritical condition, the control rods must weigh more than 2500pcm plus value of SDM (SHUTDOWN MARGIN). The total weigh of control rods is design specific, but, for example, it may reach about 6000 to 9000pcm. To ensure that the control rods can safe shut down the reactor, they must be maintained above a minimum rod height (rods insertion limits) specified in the technical specifications.